The elevator and escalator market is estimated to grow 5.6% in the next year to over $111 billion from the current $84.4 billion dollar industry it is now. Developing markets such as Asia/Pacific, Africa/Mideast, and Central/South America are expected to grow the quickest with demand for equipment and services. Some of the largest companies in the business are Otis Elevator, Schindler, and KONE. The below listing of elevator company names are from small and large businesses that focus on installation, maintenance, and manufacturing elevators. All American Elevator Co. Inc. Pride & Service Elevator Co.
White Hat Elevator & Lift Co. 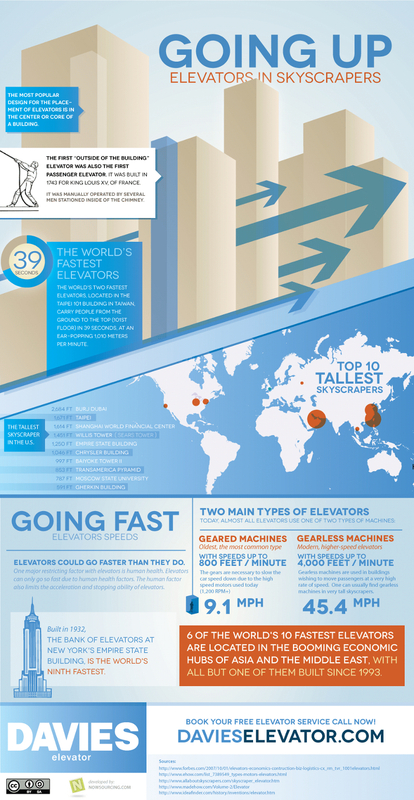 The following infographic outlines the facts and trends of elevators around the world. The first elevator was designed in 1743 for King Louis XV of France and operated by several men inside of a chimney. The worlds fastest elevator is located in the Taipei 101 building in Taiwan and can travel to the top 101st floor in 39 seconds.